Three thousand light-years away, a dying star throws off shells of glowing gas in this image from the Hubble Space Telescope of the Cat's Eye Nebula. The nearly 20-year-old Hubble Space Telescope has taken many iconic images of the cosmos and is even the star of a new 3D IMAX movie that gives viewers a chance to fly through those snapshots. But does Hubble show us what the universe really looks like? Yes and no, according to NASA. When Hubble beams down images, astronomers have to make many adjustments, such as adding color and patching multiple photos together, to that raw data before the space observatory's images are released to the public. Hubble's CCD cameras don't measure the color of the incoming light directly. But the telescope does have various filters that can be applied to let in only a specific wavelength range, or color, of light. Hubble can detect light throughout the visible spectrum, plus ultraviolet and infrared light which is invisible to human eyes. "We often use color as a tool, whether it is to enhance an object's detail or to visualize what ordinarily could never be seen by the human eye," NASA officials explain on the agency's Hubble Web site. For some Hubble photos, such as the galaxy ESO 510-G13 for example, the end result is a close approximation of the colors people would see with their own eyes were they to visit the distant sight in a spacecraft. Though even these photos are an enhanced version, since most celestial objects, such as nebulas, emit colors that are too faint for human eyes to make out. It takes a telescope, letting light build up in its CCD over time, to see the rich hues in Hubble photos. And for other Hubble images, scientists assign colors to the filters that don't correspond to what that light would look like to human eyes. They do this when using light from infrared and ultraviolet filters, since those wavelength ranges have no natural colors, or when combining light from slightly different shades of the same color. "Creating color images out of the original black-and-white exposures is equal parts art and science," NASA said. 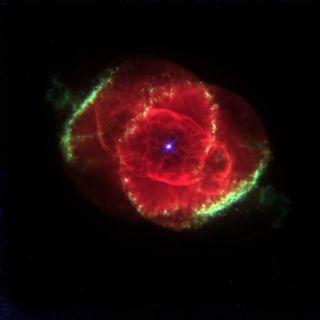 For example, Hubble photographed the Cat's Eye Nebula through three narrow wavelengths of red light that correspond to radiation from hydrogen atoms, oxygen atoms, and nitrogen ions (nitrogen atoms with one electron removed). In that case, they assigned red, blue and green colors to the filters and combined them to highlight the subtle differences. In real life, those wavelengths of light would be hard to distinguish for humans. The Hubble Space Telescope launched in April 1990 and has been visited by NASA astronauts multiple times for vital repairs, maintenance and upgrades. The most recent visit was in May 2009, when astronauts performed five tricky spacewalks to add a new camera, spectrograph, and make unprecedented repairs and upgrades that left Hubble more powerful than ever before. NASA scientists hope those upgrades will add at least five more years of life to the aging Hubble Space Telescope.